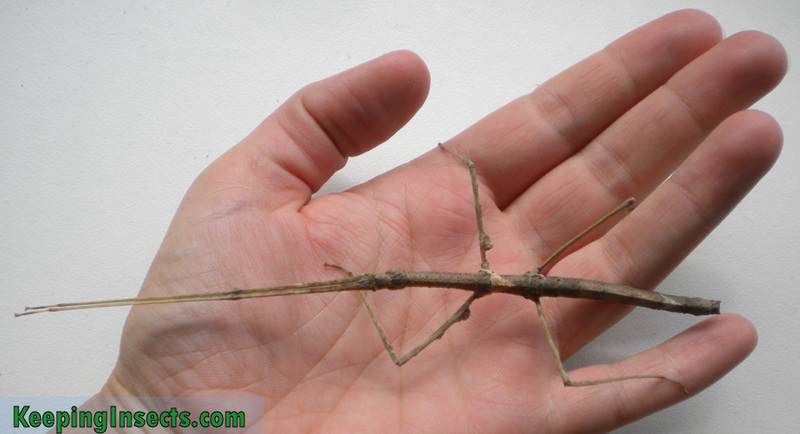 The Zompro’s Stick Insect is a nice looking stick insect and is easy to keep as a pet. It’s Latin name is Parapachymorpha zomproi and the PSG number is PSG 224. This species is originally from Thailand but is kept and bred in captivity in many countries all over the world. 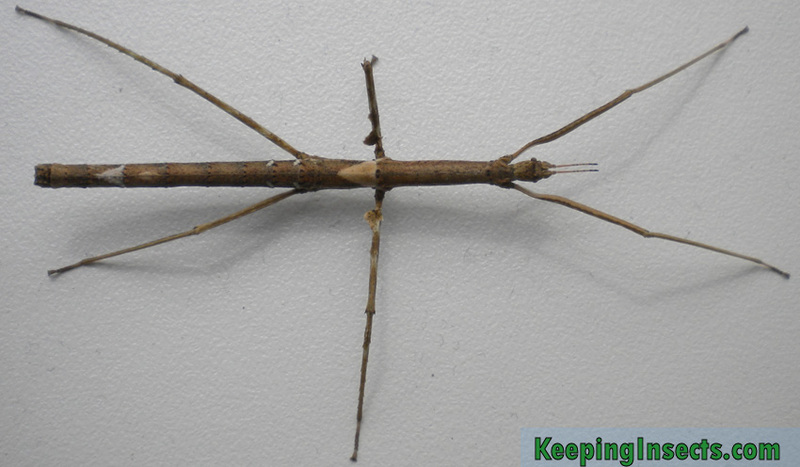 Zompro’s Stick Insect has your typical stick insect body, long and slender with long legs. The skin has a bark-like texture which gets more and more pronounces as the insect becomes older and bigger. The color ranges from light brown to dark brown. On the middle of the body of females there are two very distinct white or dark V-shaped patches. Young nymphs do not have these, but they start to become more and more appearant as the animal gets older. 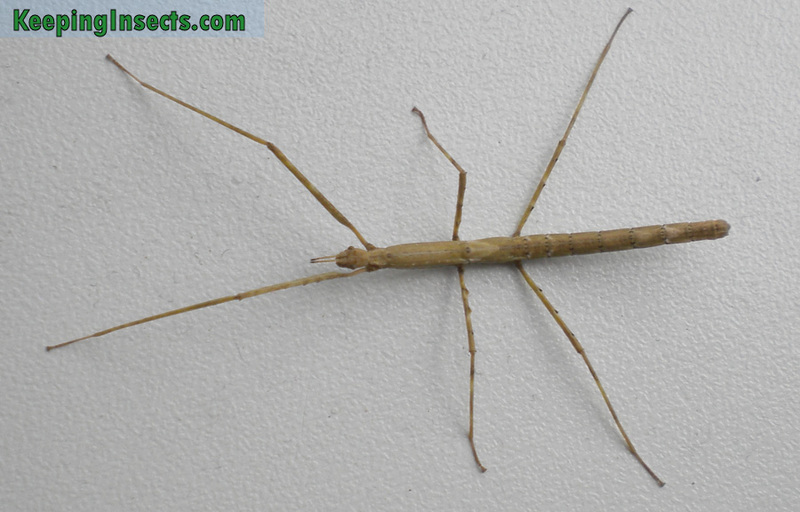 Adult males are very thin with slender legs and a pretty smooth skin. Adult females are more stocky and have a more rough-looking skin. The females also have leaf-like lobes on their legs and two tiny horns on their head. Males reach a length of around 7 cm, females will become around 9 cm long. Parapachymorpha zomproi is a very calm species of stick insect. It is handled easily and will not try to run. It cannot fly as this species does not have wings. They are night-active, during the day they mostly sit still. When handled they will walk around or will feign death by allowing themselves to drop to the floor and remain motionless. Bramble leaves and hawthorn leaves are good food for Zompro’s Stick Insect. It will also accept rose leaves and raspberry leaves. Even in winter you will still be able to find fresh bramble leaves to feed your stick insects. Present the leaves on their branch in a cup of water. This keeps them fresh. Replace the leaves every 7 days or when they are almost completely eaten. 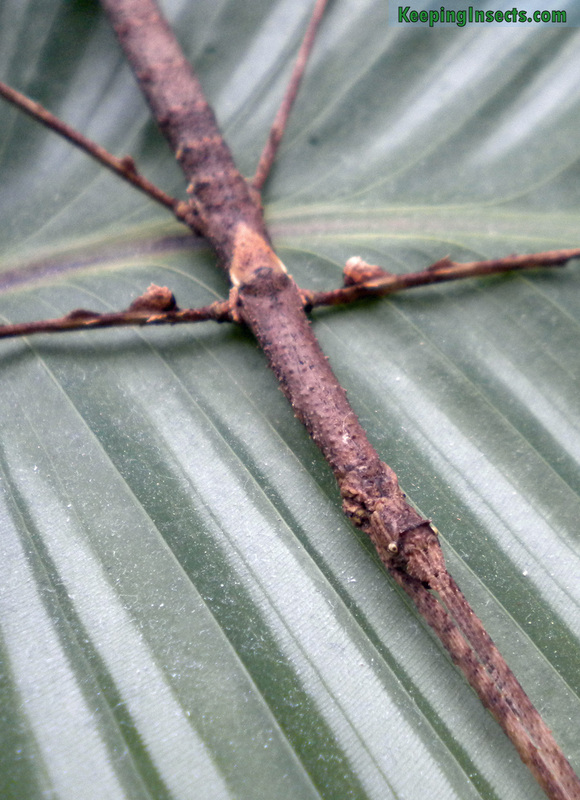 This stick insect species is pretty easy to keep. You can keep them at room temperature or a bit warmer. Temperatures around 20 °C to 30 °C are fine. In the night the temperatures can be allowed to drop a bit more. To keep the air humidity up you can spray their enclosure every day or every other day with some fresh water. Make sure there is some air circulation in their enclosure to prevent fungi forming in their substrate or on their food. As with all species of stick insects, the Zompro’s Stick Insect needs an enclosure that is at least 3 times the length of the animal in height, and at least 2x the length of the animal in width. For some adult females this means at least 45 cm high (about 18 inch) and 30 cm wide (approximately one foot). Make sure the enclosure has enough branches to hang from when they shed their skin. If the lid of the enclosure is made from mesh the stick insects could hang from that to mold. 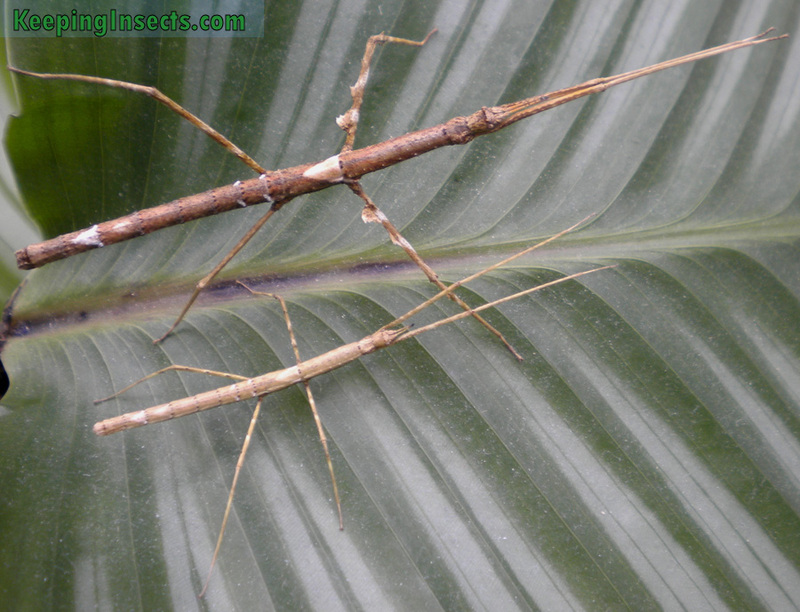 Zompro’s Stick Insect is a sexual species, which means it needs both males and females to reproduce. The males are easily distinqueshed from the females because they are more slender with a smoother skin. To breed them you just need to keep adult males and females together. The females will just drop their eggs on the floor. The eggs are a bit oval / round with a tiny “lid” on it. They are brown in color and a bit rough looking. You can keep the eggs on moist tissue paper. Keep them at room temperature and spray them with water a few times a week. It will take 4 month for the eggs to hatch. When they nymphs hatch it will take them around 5 month to reach adulthood.